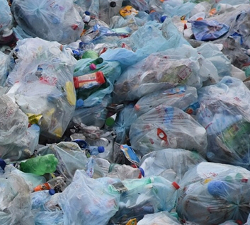 Plastic Bags cannot be Free! We reminded Croatian citizens and retailers of the mandatory charging of plastic bags, which is in force since January 1st. Since many retailers aren’t aware of the new legislation or didn’t implement it yet, we asked the citizens to report every such retailer to the relevant authorities. It also requires the retailers to put a notice “Use plastic bags sparingly,” which relates to the use of the thinnest bags. These are used for hygienic measures and for fresh produce in bulk state and are still free, but not intended for carrying other groceries. 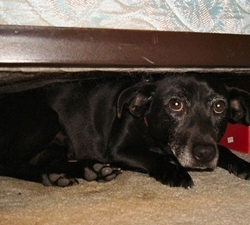 The Animal Protection Network warned about the lack of implementation of the Animal Protection Act. They commended the good examples of local communities that conducted the control of microchipping, prescribed mandatory sterilization, which promote animal adoption and educate their citizens on their responsibilities. We have announced this year‘s March for Animals! The preparations for April 13th have already begun. We believe everyone is already excited and we ask you to help us spread the news. Fani Stipkovic, Croatian television host who is working and living in Spain, joined our campaign “Don’t turn a blind eye, castrate” with a video she made with her dog friend Sauri. 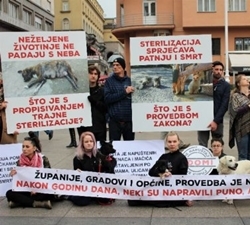 She asked the Croatian citizens to appeal to their cities and municipalities to prescribe mandatory sterilization as a means of reproduction control for dogs and cats, which has already been done by over 140 local communities. We sent a demand to the Ministry of Internal Affairs asking for a change of the Law on explosive substances in order to ban the fireworks throughout the whole year. 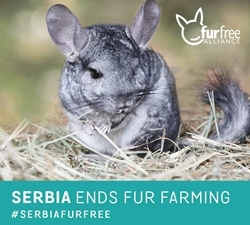 After Slovenia, North Macedonia and Croatia, another country in the region banned raising animals for fur production. After ten-year-long transitional period for implementing the Animal Welfare Act, the ban came into force. 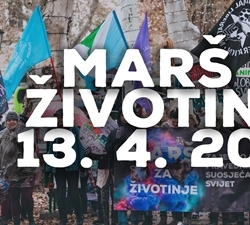 Animal Friends Croatia and a citizen initiative VEGAN THUGZ will treat ten non-vegans with a delicious vegan dinner. We sent a demand to the Ministry of Agriculture asking for a change of the Sea Fishing Act which allows children younger than fourteen to do recreational fishing. We reacted to the Croatian National Theater for using live geese on stage in a play. We reported the use of pink-dyed pigeons as a tourist attraction by unknown individuals. We wrote a letter to the Norwegian Embassy in Croatia and the Norwegian government regarding their decision to kill wolf packs in a protected wolf zone. We sent a copy of the book Vegan Diet for Children of Kindergarten Age to all libraries in Croatia. Thank you all who helped us with their membership and donation. If you haven’t already, please back us with your donation so we can continue working for animals. Support our work with a standing order, donation, or annual membership fee. Every donation, no matter how small, means a lot to us! Follow us on social networks: Twitter, Facebook, LinkedIn, Instagram and YouTube.